Telurian Revision 2 design ideated below. The ratios for the drivetrains that rotations/revolutions of Earth about Sun, and Moon about rotating Earth, have been vastly improved with the new drive train calculations. Prototype will follow. It’s a mechanical model of the Earth traveling around the Sun. That means the Earth turns 365.7 times each time it goes completely around the Sun. There’s a Moon that is traveling around the Earth. It goes around the Earth 27.3 times the Earth turns. 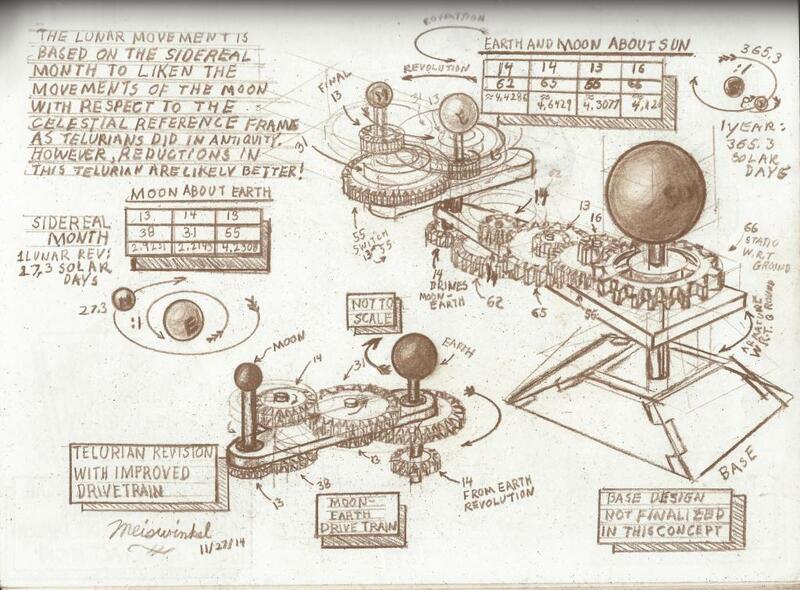 So, the Earth model moves around the Sun and the Moon moves around the Earth. They move in the model as they move in the heavens. All clocks are actually celestial models. They all tell us how far along we are in our rotation with respect to the Sun (Days) and many tell us about the movements of the Moon and the Revolution of the Earth about the Sun… Months and Days. I don’t believe in astrology. I do believe what happens on Earth has a lot to do with much larger events in the heavens! In Revision One, I tried to make this model using natural logs and Astronomical Units. In Revision Two, I changed units from distance into units of time. 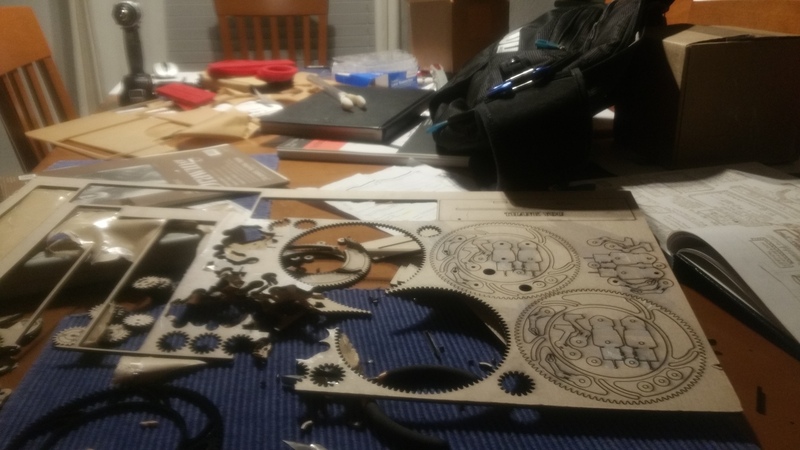 Then, I applied the new drivetrain heuristics I developed a few years ago. The changes to the approach of problem started to become very simple… The first approach was an earnest Keplerian tack… but, this method is lifted almost right off of calendars and clocks!… Went like clockwork! My PhD has been a long journey for me. A lot of good folks have helped me to reach this goal. I decided I would do something special for my committee. 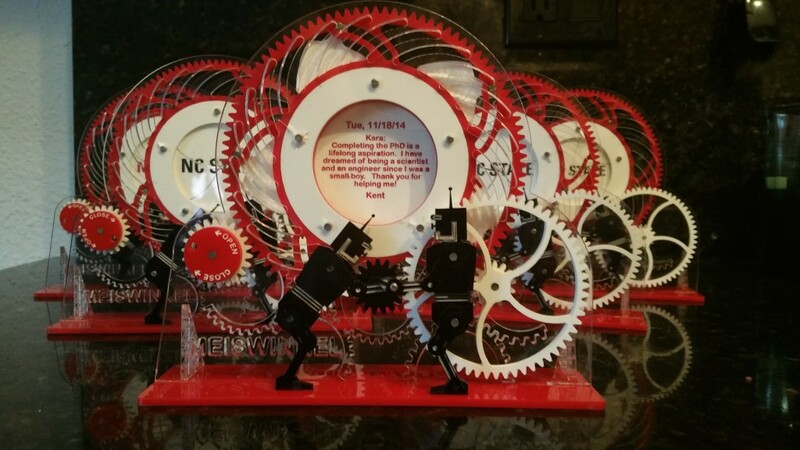 So, I fabricated some custom mechanisms, to create a “mechanical Thank you Note” for each committee member. Components are all cut from 1/8″ acrylic on my 50 Watt Universal x600 Laser cutter. Patterns were ideated in sketches and then advanced into Solidworks. Solidworks models were then exported into Adobe Illustrator for fine adjustment of the vector and raster routines. 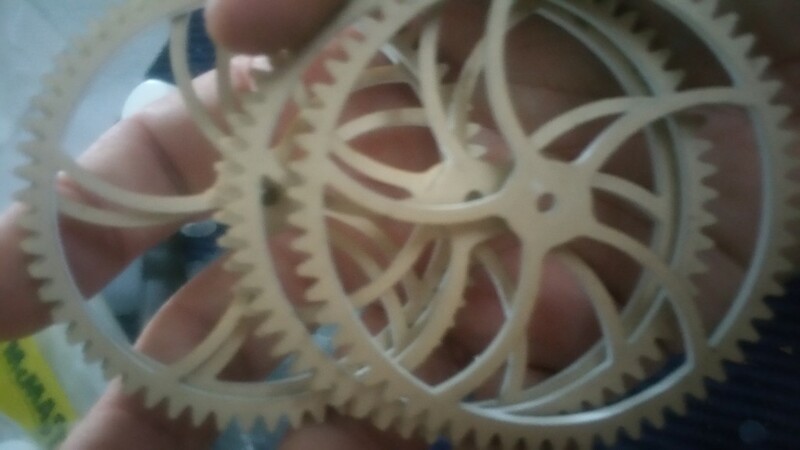 Since most of the plastic was cast, it came with a paper coating. I always leave it on for the cutting so that I can manage a few cool effects I like to incorporate on my patterns. This comes at the cost of some fairly laborious peeling of all of the paper off of the components. 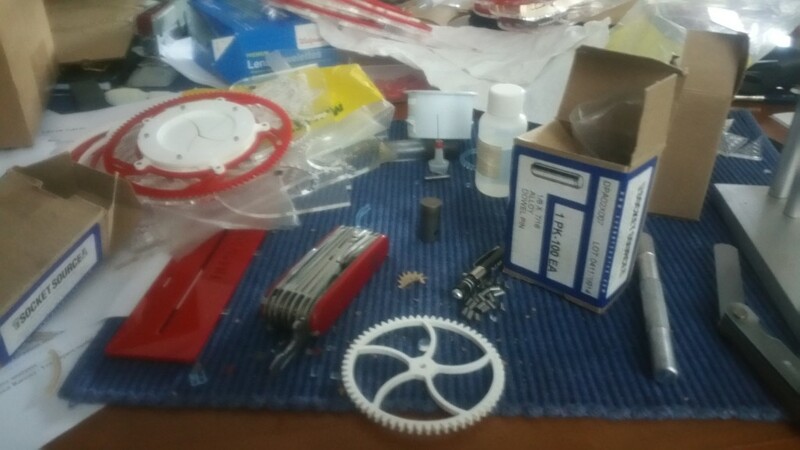 Here is an early dry fit of the shutters of an iris and one of the compound gears that mates with the iris actuator ring. Many copies of each of these parts were made for this project. I was particularly enamored with just how beautiful the white plastic looked. This plastic came from Tap plastic in Fremont and seemed so much more bright that the stock I had been getting from McMaster or Raleigh Plastic and Fiberglass. The edges were more square as well. When I saw how well it contrasted with red I was thrilled. 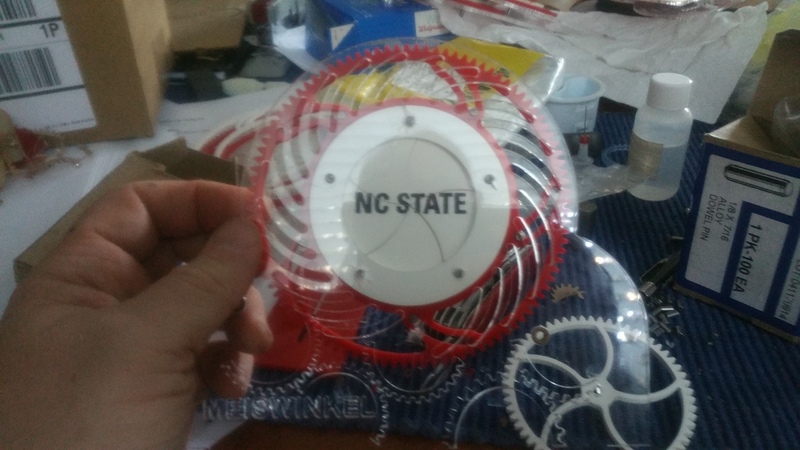 Both white and red are NC State colors. Mechanically, they seem more stout. I can’t quantify just why yet. Here, the entire assembly cave be seen. Multiple copies show how consistent the process is. In the animation, the movement of the robot characters can be seen as the iris is opened to reveal the personal message to the recipient of that mechanism. There are 6 of these units in total.